Both the Kindle Fire HD 7 and 8.9 are excellent value tablets for the solid, capable hardware you're getting. But you need to think carefully about what you want from a tablet and what the alternatives are. After their first release two years ago, Amazon's Fire tablets have grown into some of the most popular slates on the market. The Kindle Fire HD is no longer Amazon's main budget-centric device (that's the Kindle Fire HDX), but it's still available and for an even lower price. Starting from just £95.20 for a 7-inch HD display and a 1.5GHz dual-core CPU with 8GB of onboard storage, the Amazon Kindle Fire HD 7 appears to offer great value for money. There's also a 16GB version offered, which for the extra £16 definitely seems worth it. If you fancy a little more screen real estate you can plump for the 8.9-inch Kindle Fire which starts at £127.20 for the 16GB version, while the 32GB option is still an affordable £151.20. Expect to pay £8 more if you want one without Amazon's 'special offers', targeted marketing that appears on the lockscreen and at the bottom of the home screen, but isn't too obtrusive. The Amazon Kindle Fire HD 7 certainly no longer matches the new Nexus 7 in terms of raw power and screen quality, though it chops a lot off the asking price. It comfortably trumps the iPad mini on price, while offering a similar screen resolution to the original. If you still think of Amazon Kindles as those little monochrome holiday companions, then you should know that the Amazon Kindle Fire HD tablets are completely different beasts. 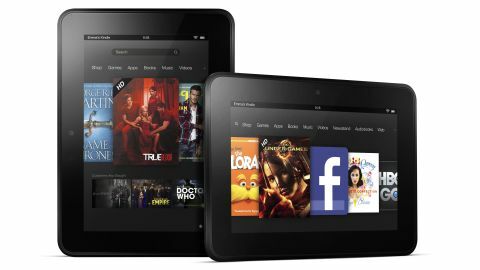 Rather than focusing on the very specific job of downloading and reading electronic books, these are all-purpose tablets that act as windows onto Amazon's wider multimedia world - films, music, apps and games are all included in the Kindle Fire HD's remit. With that in mind, the Amazon Kindle Fire HD range is a much simpler, purer design than the original Kindle. The emphasis here is on the screen first and foremost, with the only hardware controls coming in the shape of volume and power buttons on top of the devices, right alongside the 3.5mm headphone jack. The lack of a fixed home key adds to that minimalist vibe (I'll discuss the effect that has on usability later). There isn't even a front-facing camera, so no Skype chatting on this device. Amazon has updated the design of the 7-inch variant to bring it in line with the HDX range and its rivals in terms of build quality. The 8.9-inch option hasn't been given the same treatment though. Despite the impossibly low price point, the Amazon Kindle Fire HD doesn't feel like a cheap device. It's solid in the hand, with none of the creak you find in many budget Android tablets. There's a nice contrast between the Amazon Kindle Fire HD's smooth, glass front and its grippy matte, soft-touch back. It's quietly pleasing from a tactile perspective, even though it lacks the sheer machined precision and premium feel of Apple's tablets. While Apple has opted for a super-slim bezel for its iPad mini - partly to facilitate that wider 7.9-inch display - Amazon has been more generous with its own offerings. Indeed, the fairly thick border around even the smaller 7-inch screen brings it closer to the full-sized iPad in design than its miniature brother. I like this approach from a purely practical perspective (although it makes it look a little chubby, if I'm honest). It's still comfier to hold the seven-inch model between your thumb and fingers than it is to rest it in the span of your hand, even when held in portrait view. Of course, that's partly because it's slightly chunky for its size - at 345g the 7-inch model is just 14g heavier than the iPad mini. The display on the Kindle Fire HD packs a decent resolution of 1280 x 800 with a ppi of 216. It's the same display as the original Kindle Fire HD model from last year, so expect the same slightly yellow tint, especially when you're looking at a white background. Indeed, once your eyes have grown accustomed to its warmer hue, you'll no doubt begin to appreciate the Amazon Kindle Fire HD display's more naturalistic colour contrast - particularly when viewing video content. It's certainly not in the same league as the Nexus 7, or the Retina-toting iPad Mini, but it's more than a match for the original compact slate from Apple. The display is pleasantly sharp. This isn't particularly apparent within the main Kindle Fire interface, but it certainly bears fruit when reading a book or browsing the internet, where small text remains clear and eminently readable. This display is powered by a capable 1.5GHz dual-core processor. While this is far from the most powerful processor on the market, it is very well balanced, and it certainly doesn't come up short when faced with demanding tasks like high-definition video and 3D games. One final piece of hardware-related info I really must cover is the Amazon Kindle Fire HD's impressive sound. Positioned on either side of the device (if you're holding it in landscape), the speakers are surprisingly punchy, given their size. They really do crank out some respectable stereo sound - both in terms of volume and clarity, and it reminds us a lot of the power of BoomSound on the HTC One. Naturally, I'd recommend using earphones whenever possible, but for those times where you're just following a quick email link to a YouTube video, they're more than adequate.